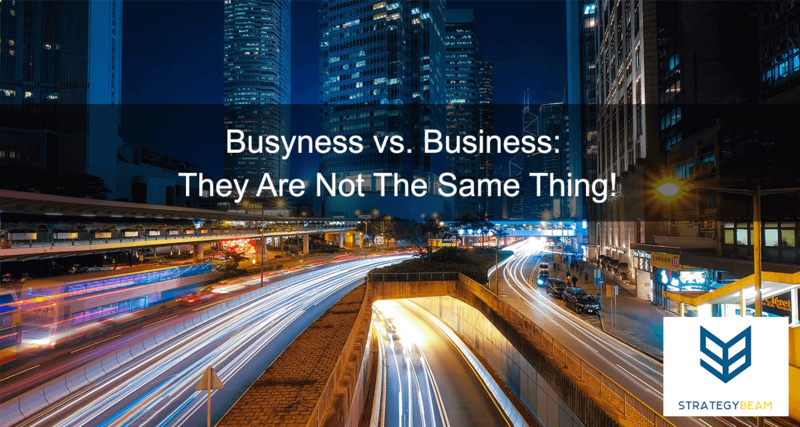 Busyness vs. Business: They Are Not The Same Thing! After working with many entrepreneurs, it has become painfully clear that many leaders confuse being busy with being productive. It doesn’t matter how new or old the organization is. It never ceases to amaze me how many people think that staying active is the same thing as being productive. This topic came up during a recent discussion with the amazingly talented Shea. We met at a great little juice bar near both our offices. During our conversation, it came up about how easy it is to slip into the habit of just doing stuff and not producing the value from that time. Shea is one of the smartest business leaders I know. She taught me pretty much everything I know about SEO marketing, freelance copywriting, and other online marketing strategies. While talking, I accidentally said, “wow Shea, you are busy!” when I heard all the great things she is doing with weVenture and her many other projects. Right after I said this, her eyes lit up with an intense energy and surprise, almost as though I insulted her. This response was great and got me thinking because it drove home the difference in my head between doing stuff and doing stuff for a purpose. People who confuse busyness and productivity look stupid when they exclaim “I worked 17 hours yesterday!” You can almost see in their eyes a sense of accomplishment. The satisfaction that they put more time and put more energy into their work than anyone else did. OK, congrats. Do you want a balloon? What the heck am I supposed to do with that information? Why are you so proud of that arbitrary number? And why are you so excited to tell me how you spent your day? Leaders are required to invest large chunks of time to fulfill their position requirements. That is a sunken cost if you want to run a business. Whether you are the leading SEO copywriting professional in Orlando or the best sprinter you need to put the time in to achieve success. I get that – there are seasons in my life where I pour massive amounts of time and action into a project because it needs to happen. But there is the difference between fulfilling your duty and wearing that time with pride. The thing that gets under my skin is when people wear the time that they put into a project as a badge of honor. Does your time define you,? The fact that people get enjoyment out of spending time on something means nothing. People who hear you brag about how many hours you worked are not impressed. It is not the time that you invest. It’s the value you produce that matters the most for your audience. Up until a few months ago, I wore one of those smart watches that told me how many steps I would take throughout the day. I thought this was awesome because I wanted to keep in shape and the watch made it feel like I was playing a game by tracking those steps. After about a month I realized that basing my health on the “number of steps” I take in a day is worthless. I was providing a low-quality benchmark to gauge my success. I noticed the watch considered a lazy step the same as if I were sprinting full-speed. The metric of measures taken was a flawed metric to gauge my health off of! This is the exact same thing if you only look at the time you are busy. The thing that matters is the output and value, not the time you put into it. If you are overwhelmed and struggling to find the time to get your work done, then consider checking out the many free online marketing tools for small business owners. If you brag about how much you spend on a project, I suggest you stop. Like now. You sound like an idiot, and no one is impressed. Don’t be busy, have intentional movement. Don’t be busy, have passionate momentum. Don’t be busy, walk a focused path. Begin measuring input and value by definitive metrics that drive the overall intention of your project. Start with the end and craft a strategy that leads to the ultimate goal.